I’ve never been one for washcloths, having always preferred the luxurious suds created by a bath puff. With one skein of yarn and simple stitches, you can crochet yourself what will hopefully become the best bath puff you’ve ever owned. Make sure your stitches are loose to allow for maximum sudsing power. Please be advised that this bath puff took nearly my entire skein of yarn (I was left with 17 grams). If your gauge is off you may find you need a second skein. If you wish to make a yarn substitution you’ll want to look for another 100% cotton in a worsted weight. 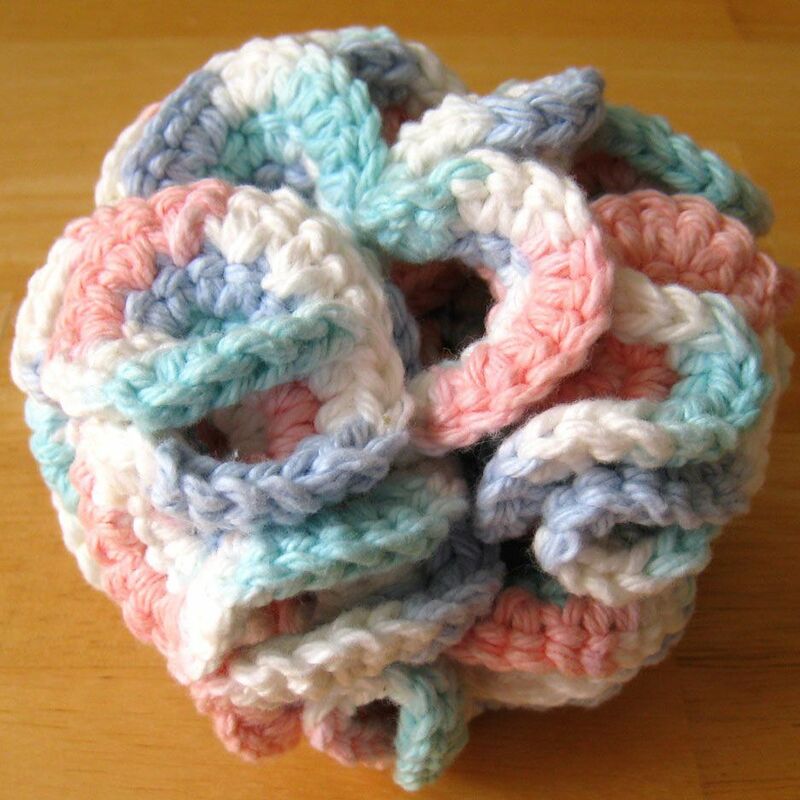 180 to 200 yards of your yarn will be needed to crochet a bath puff of similar size to the one in the photos. 12 double crochet = 4” using size I/5.5mm hook. Gauge is not critical for this project, but you’ll want to make certain your stitches are relatively loose. Remember that if your gauge doesn’t match mine your yardage requirements will be different. With smaller crochet hook ch 8, sl st in first ch to form ring. Rnd 1: Ch 50 tightly (forms hanging loop), sl st into base of first ch st. Switch to larger hook. [Ch 4, sl st into center ring] 30 times -- 1 ch-50 loop and 30 groups of ch-4. Rnd 2: Sk first ch-50 loop, sl st in next ch-4 sp, ch 3 (counts as 1st dc), 8 dc in same sp, *9 dc in next ch-4 sp; rep from * to end, sl st to top of beg ch-3 -- 270 dc total. Rnd 3: Ch 3 (counts as 1st dc), 2 dc in same sp, 3 dc in every st around, sl st to top of beg ch to end -- 810 dc total. Fasten off and weave in all loose ends. This Pixie Hood Free Crochet Pattern Is The Cutest Pattern Ever!